It seemed like the years stretched out ahead with plenty of time to spare and now suddenly, that time is up and you’re getting ready to send your child off to college. This year I’m joining the ranks of parents who are prepping their kids to live away from home for the first time. As I assemble my own list, I’m looking to make my new college student as comfortable and organized as possible with the least amount of furniture, supplies and accessories to keep track of. With a smaller space and a roommate to consider, there won’t be room for her shoes in the middle of the room, her towel bunched up on the bathroom floor, or her little piles of bobby pins everywhere. Whether your child stays in a dorm or their first apartment, it’s likely they will be dealing with a small space. With a roommate (or roommates) and the demands of taking care of themselves on top of continuing their education, I’m committed to going with a less is more approach to setting my daughter up. My kid will be staying in a dorm room with a roommate. Her college supplies a twin bed and a small desk and dresser. While she won’t need much in the furniture department, here is a list of top items needed for dorm life. 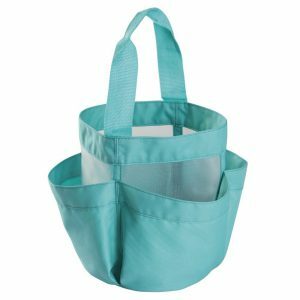 This Water Resistant Bathroom Tote from Amazon comes in mint or navy. 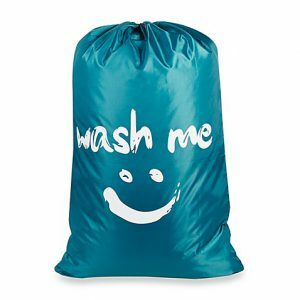 The playful laundry bag is from Bed, Bath and Beyond. 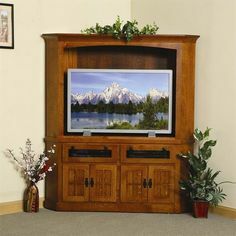 If your child will be housed in their first apartment, we’re recommending these top three furniture items that are great for saving space. Items are likely to be moved in and out of dorm rooms or apartments for the next four years, so durability is a major factor to consider. 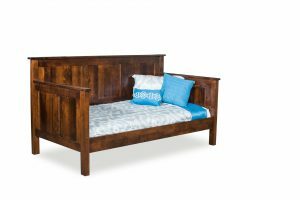 A day bed like the Amish Panel Day Bed can double as both sleeping area and couch. Keep in mind the space underneath for storage. 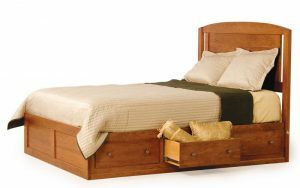 A storage bed like the Amish Modern Platform Storage Bed offers extra storage space. Particularly useful if there’s little closet space. 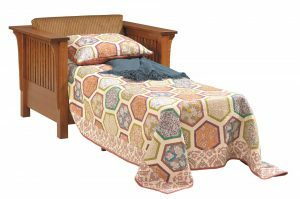 The Amish Mission Prairie Chair Bed offers two pieces of furniture in one and saves space in a shared bedroom or small apartment. 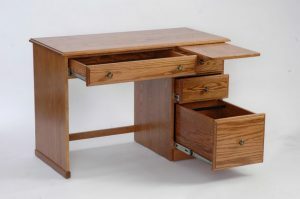 For late night papers and daily studies, the Amish Pencil Desk is simple, small and features a slide out writing board to expand surface space. 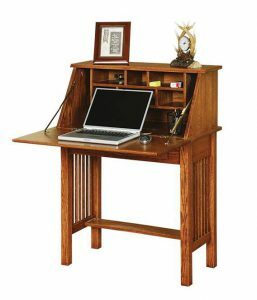 The Amish Mission Corner Computer Desk lets your student make use of a corner in order to save space. 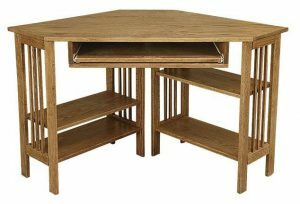 A secretary desk like the Amish American Arts and Crafts Secretary Desk makes another great student desk option. It is small and compact and closes up neatly. 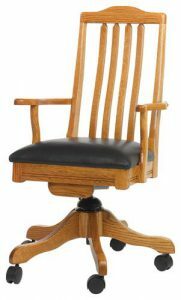 Set your student up with a good supportive seat with the Amish Shaker Desk Chair. Ottomans are no longer just for feet and come in handy as mini tables and extra seating. 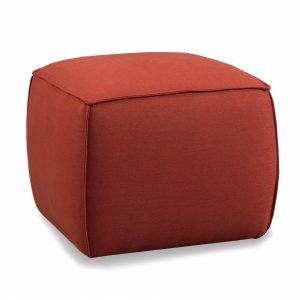 If space allows in apartment or dorm, invest in an ottoman that your student is sure to get a lot of use out of and is easy to move. 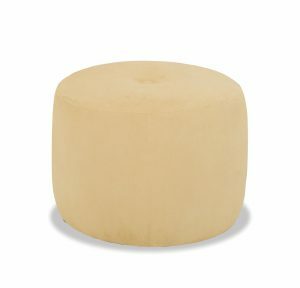 Add some fun colors to the student living scene with a cushy Mia Caster Ottoman or Alice Ottoman by Precedent. One worry to cross off the list is your student’s new furniture wearing out or breaking down. 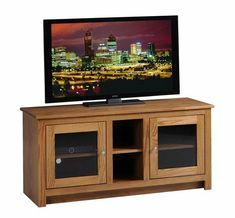 These solid wood space saving items are ultra-durable and will last long after graduation. I’ll make a checklist of items needed, and once they’re all crossed off I’ll give my daughter a hug and leave her to greet her new college experience. Will I miss her shoes in the middle of the kitchen, her towel bunched up on the bathroom floor, and her little piles of bobby pins everywhere? Yes. You bet I will.